The £1 million botanical-style restaurant at a Dorset garden centre has been unveiled. The restaurant, constructed by Smiemens Projecten of Holland according to detailed drawings prepared by MSC’s architectural technologist Alexandra Ginés Heiwegen, has now opened its doors to customers. Malcolm Scott Consultants gained permission for the 176-cover facility and other site developments and had a number of specific considerations to overcome in preparing the concept designs. Chris Primet, of MSC, said: “Groves Garden Centre is located within an Area of Outstanding Natural Beauty, so we had to ensure – and reassure planning officers – that our proposed structure wouldn’t have a negative impact on that. The finished designs were created to catch the eyes of the thousands of drivers and passengers travelling along the A35 – located just 10 metres away – and will utilise curved glass panes to complement and reflect the surrounding area. The building is positioned to curve away from the A35 rather than presenting a vertical elevation, a concept MSC had used at a previous centre, enabling the team to demonstrate how effective the end result would be to officers. 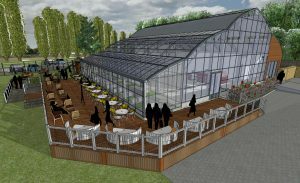 “We felt that a curved glasshouse would convey a horticultural message, both in the way the surrounding tees are reflected in the glazing, and by way of the fact that diners can see through it to the landscape beyond,” Chris added. Charlie Groves, of Groves Garden Centre, said: “We have had a fantastic response from customers. Along with everyone else we have had a record breaking May and the boost in restaurant sales has been the icing on the cake! “The design and positioning of the restaurant has been the standout triumph of the project and the light airy space combined with the wonderful outdoor seating has meant we have been able to make the most of the great early summer weather. “We have already had business breakfast meetings and children’s workshops during half term. Next week Valarie Singleton is giving a talk and we have our first evening party from a local sports group. We also have a couple of wedding receptions booked in and some more evening parties in the future. None of these were advertised for; they are all due to the unique design of the building, led by Alex and Chris, making it stand out from the rest of the town,” he added.